This is the public profile of Kabarovsky, Additional information and high-resolution images are available for accredited press members, to access additional information about Kabarovsky please login as a press member. About Kabarovsky : Kabarovsky – the successful brand to combine tradition and fashion. In the XXI century even the art has been created by software engineers and intelligent machinery. Jewelry design is not a craftsman master peace anymore but a precise machine product. The modern jewellery pieces may look nice but our admiration has been inspired not by the master-jeweller but by the engineer skilfulness and his machine precision. 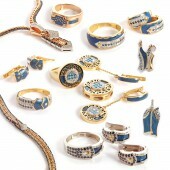 Kabarovsky Jewelry House is not aside of modern technology but keeps the jewelry art tradition, hot enamel in particular. That well known sophisticated technique has been lost in many countries. The reason is obvious: the hot enamel can be laid only by hand and so time consuming. Kabarovsky hot enamel turns cold gold jewelry into a living green branch, bright exotic flowers and even denim. Kabarovsky - tradition and fashion. Any art must cause a surge of emotion. When a piece of cold metal in the hands of jewelers turns into delicate flower, a soaring bird, symbol the mysterious - this causes admiration and joy. We believe that our jewelry - is an art that is always with you! Maybe we are not always at the peak of fashion trends, but we always create a beautiful story to our collection. Press Members: Request an exclusive interview with Kabarovsky.